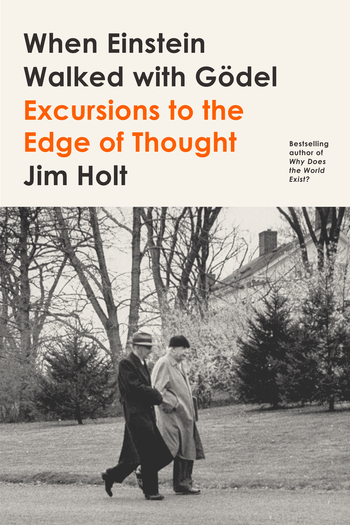 From Jim Holt, the New York Times bestselling author of Why Does the World Exist?, comes an entertaining and accessible guide to the most profound scientific and mathematical ideas of recent centuries in When Einstein Walked with Gödel: Excursions to the Edge of Thought. Does time exist? What is infinity? Why do mirrors reverse left and right but not up and down? In this scintillating collection, Holt explores the human mind, the cosmos, and the thinkers who’ve tried to encompass the latter with the former. With his trademark clarity and humor, Holt probes the mysteries of quantum mechanics, the quest for the foundations of mathematics, and the nature of logic and truth. Along the way, he offers intimate biographical sketches of celebrated and neglected thinkers, from the physicist Emmy Noether to the computing pioneer Alan Turing and the discoverer of fractals, Benoit Mandelbrot. Holt offers a painless and playful introduction to many of our most beautiful but least understood ideas, from Einsteinian relativity to string theory, and also invites us to consider why the greatest logician of the twentieth century believed the U.S. Constitution contained a terrible contradiction—and whether the universe truly has a future. Jim Holt writes about math, science, and philosophy for The New York Times, The New Yorker, The Wall Street Journal, and The New York Review of Books. His Why Does the World Exist? : An Existential Detective Story was an international bestseller.